Zuzana Lundeen makes her traditional Slovakian Oplatki in her home in Saratoga Springs, October 28, 2018. Love and blessings. Good health. Joy and good luck. 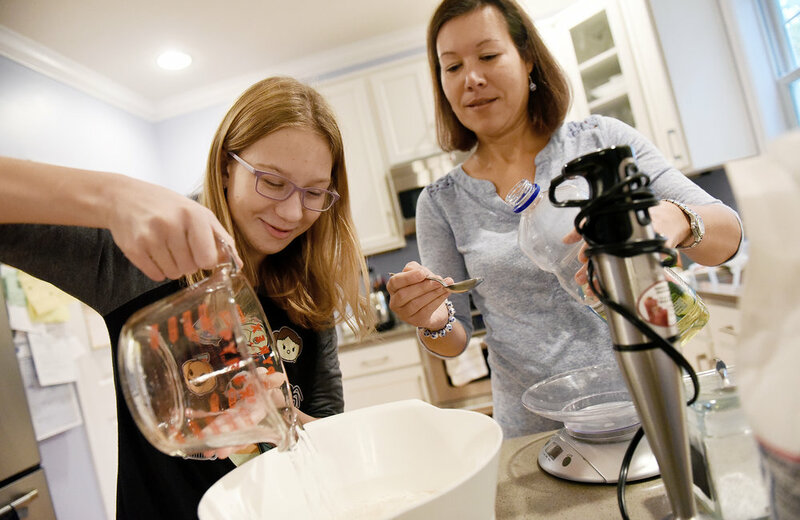 On Christmas Eve, as they gather around the table in their Saratoga Springs home, David and Zuzana Lundeen and their two daughters share a thin white wafer called an oplatek. There is a prayer, and then, as the wafer is broken, each person receives a small piece along with heartfelt best wishes. In Zuzana’s native Slovakia, the oplatek is a beloved Christmas tradition that is centuries old. Believed to originate with early Christians, the custom began in Poland in the 17th century and then spread to neighboring countries. Immigrants brought the practice to this country, and in the 21st century, their descendants go online to buy commercially made oplatky. These wafers are often square in shape and embossed with a Nativity scene. As Christmas draws near, Zuzana makes hundreds of the fragile Saratoga wafers and wraps them in pale green tissue paper. 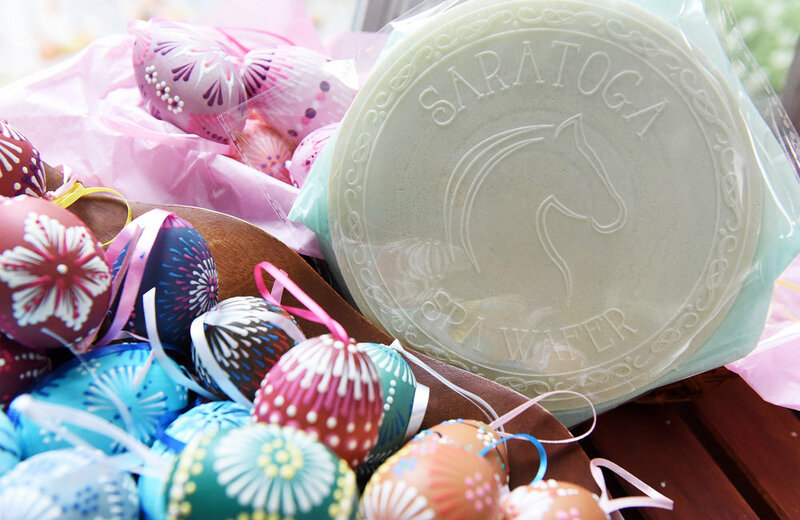 For the past two years, she has sold Saratoga Spa Wafers at Blessed Virgin Mary of Czestochowa National Catholic Church in Latham during its PolishFest in June. Last Saturday (Dec. 1), Zuzana and her oplatky returned to the church for a Holiday Craft Fair. And she and her husband David, who provides technical support for their booth, have already been invited to the 2019 PolishFest. 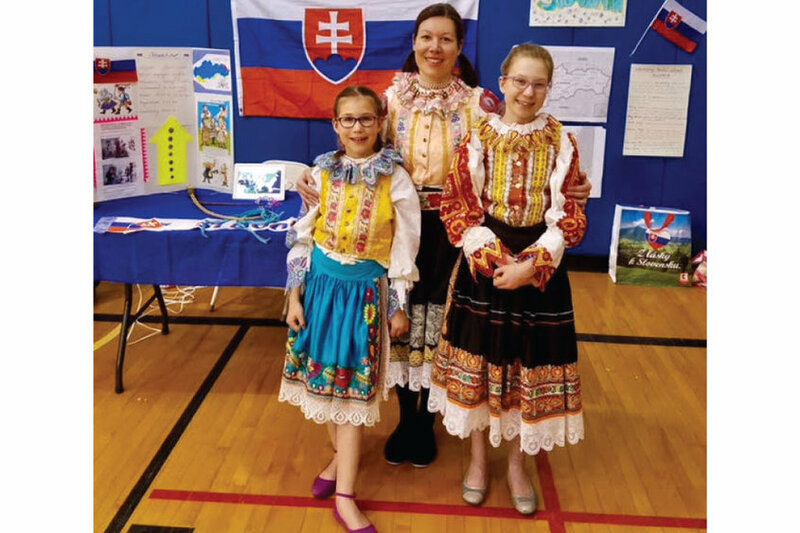 Zuzana and her daughters Emma and Nela, in traditional Slovakian dress, have also shared the story of oplatky at the annual Cultural Night at Division Street Elementary School in Saratoga Springs. 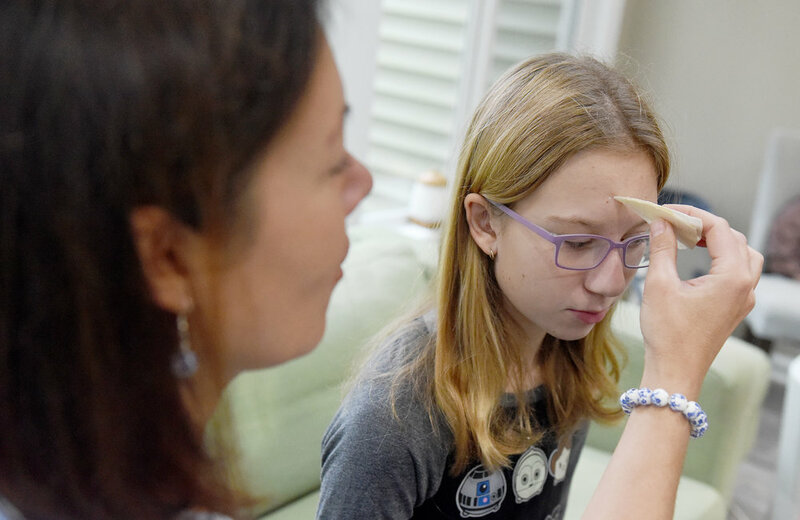 A few weeks ago, Zuzana invited this Gazette freelance writer (Polish-American) and Gazette photographer Erica Miller (Czech-American) to watch how she makes them. On a kitchen counter, Zuzana and Emma whip the four simple ingredients – flour, vegetable oil, water and a smidgen of sugar – in a big bowl. Zuzana’s recipe, in metric measures, makes 80 oplatky. “It’s how my Dad makes them. It needs to be very smooth,” she says. 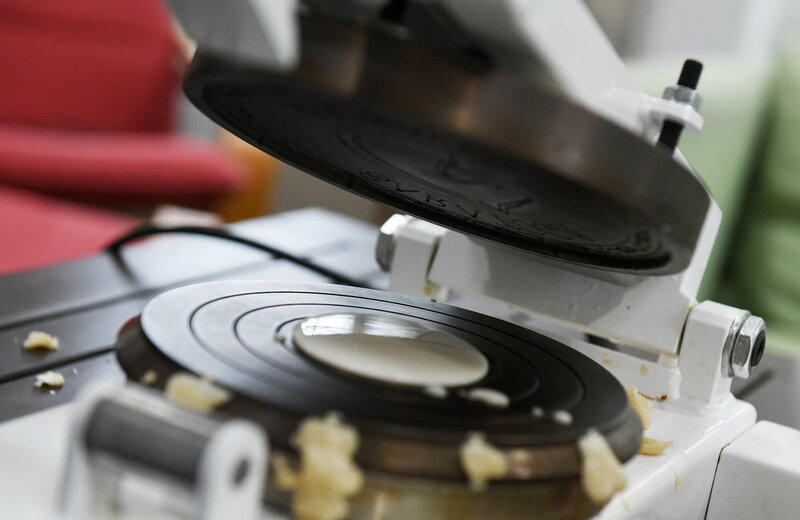 When the batter is ready, she carefully pours a spoonful on the flat round plate in the center of the oplatky press. When she pulls down the heavy handle, pressing the design into the batter, a cloud of steam rises into the room with a loud hiss. “It takes about 10 seconds. You know by the steam,” she says. A minute later, she hands us an airy edible artwork that’s like an ultra-thin Italian pizzelle. “Everyone in Slovakia makes them round,” she says. Zuzana and David, a process engineer at GlobalFoundries, wrapped the heavy machine in clothing and packed it in their luggage when they brought it home from Slovakia four years ago. Honey on the oplatek is another Slovak tradition. Zuzana drizzles the sweet stuff on a wafer, breaks off a piece and covers the honey with pieces of wafer to form a tiny sandwich. With one hand, she touches the honey-filled wafer to her Emma’s forehead and draws an invisible cross. Zuzana, a reiki practitioner at Tushita Heaven in Saratoga Springs, always makes sure there is goodness in her heart when she makes oplatky. While oplatky always show up at Christmas, they are also made and eaten year-round in Slovakia. Double wafers with a chocolate filling or plain ones are enjoyed like a snack with coffee. Salty oplatky are served with wine. Piestany, Zuzana’s city of 30,000 in western Slovakia near Czechoslovakia, is home to the country’s largest and most famous spa resort. After soaking in the hot mineral springs, visitors buy fancy boxes of oplatky as souvenirs. “It’s very typical in a spa town,” Zuzana says. However, it was microchips not mineral water and a romance with an American that led Zuzana from her European spa town to a spa town in the U.S. In 1999, Zuzana Miklovicova met David, a Connecticut native, while he was working at a microchip manufacturing facility in Piestany. They married in 2002, and their daughters were born in Slovakia. In Slovakia, Christmas Eve is a night of solemn celebration, Zuzana says, and it begins when her father walks into the house with a special illuminated “Bethlehem candle” from the church. The father or mother presents a piece of the wafer and a blessing to each child. A meatless Christmas Eve meal called “Velija” follows. In Saratoga Springs, the Lundeens, their daughters and friends will dine by candlelight on Dec. 24. There will be cabbage soup with mushrooms, dried plums and dried apples, then fish and potatoes, and many cookies. As for the oplatky, any American family is welcome to add this custom to their Christmas Eve. “I would love that,” says Zuzana.